Why Use Stop-Motion Animation on iPad for Education? Stop-motion animation can be created with Animate It! iPad app, so it’s easy to incorporate animation assignments in an iPad classroom. Stop-motion animation on iPad allows students to explore their storytelling ability and creativity. Mix an iPad camera, some art supplies, the Animate It! iPad app, and a healthy dose of imagination, and your students can create some amazing stop-motion animation videos. Traditionally, creating stop-motion animation was a cumbersome and time-consuming process. You’d have to physically arrange objects, walk back behind a camera, and snap a photo; then move the objects and repeat the process. Of course, if your objects weren’t moved in exactly the right alignment and spacing, you’d have to shoot the frames again. 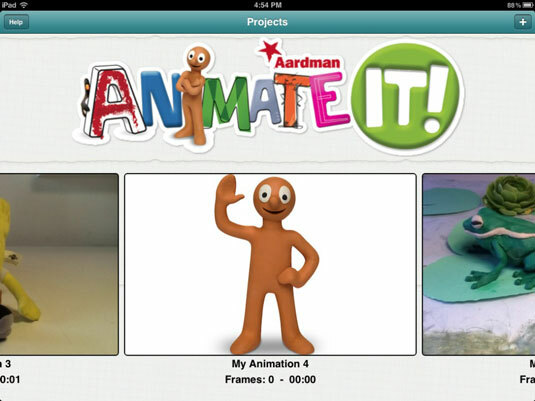 Aardman Animations Studios, the creator of the Wallace and Gromit series, has created Animate It!, a wonderful app that lets you create your own stop-motion animations. Animate It! lets you snap a series of images on your own portable device. Take it anywhere, create a scene, and animate on the go. Students can create a scene and objects out of anything that’s available. Plasticene (you’ve probably heard of claymation) is great. But students can also use LEGO pieces, paper, puppets . . . anything. Students can even draw or write something on paper and take images of the message/illustration developing and moving. Considering the quality of the output that can be produced, using the app is relatively simple. And it’s a boatload of fun. Animate It! includes features and tools that bring any subject to life, including a time-lapse feature, variable frame rates (to ensure that the animation is smooth and consistent), as well as copy, paste, reorder, and frame deletion functions. You can export your creation in several formats, including HD. Why use stop-motion animation for classroom assignments? It helps young students learn to break down, analyze, and re-create an event in small, bite-sized pieces. Consider using it in a science class, for example, to have students demonstrate the evolution of a process, such as the water cycle showing the stages of transpiration, precipitation, and so forth. Maybe it’s the life cycle of a butterfly. Re-create events. Use it in a social science class to get students to re-create a famous scene from history, such as the Battle of Little Big Horn or the American soldiers raising the flag on Iwo Jima in World War II. One motivated group of students did a stop-motion movie of U.S. history from the Native Americans to the moon landing! Sure, it was an abridged version of American history, but it was wonderfully entertaining nonetheless. Imagine the planning, research, and teamwork that went into that project. Have students create a short animation to illustrate an event or scene from the book they’re reading in literature. It’s a great alternative to dioramas. Students can use action figures, plastic figurines, LEGO pieces, Kinex, paper cutouts, drawings, plasticene, or Play-Doh to create scenes. Kids will have a blast creating movies. Your biggest problem might be dragging students out of their chairs at the end of the lesson.